Apple releases iOS 11.2.2 which fixes Spectre bug. WHY IS IT IMPORTANT TO INSTALL THE UPDATE? As we have already talked Meltdown and Spectre in the previous Newsletter. 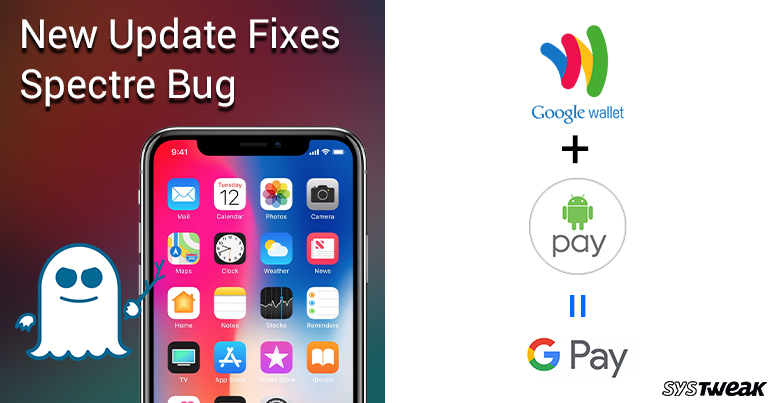 They are very serious security loopholes about It is always recommended to install and update your devices with security patches released by your OS developers now and then. With Meltdown, a malicious app running on an unpatched device can read the unencrypted kernel memory. You certainly don’t want hackers or intrusive people to get hold of your password and private encryption keys. Meltdown has already been addressed with previous updates. iOS 11.2, macOS 10.13.2 and tvOS 11.2 for iPhone, Mac, and Apple TV respectively. Apple Watch owners are lucky as their smartwatch is not affected by these vulnerabilities. This update fixes the loophole, securing your device from Spectre.Spectre is not that big of a deal as compared to Meltdown as it just cracks the isolation between multiple applications. You can install Software update by locating Settings on the home screen. Tap on Settings-> General-> Software Update. If you are using MacOS, open Mac App Store->Click check for updates. Google- Android payment method streamlined. IS IT A SIGH OF RELIEF? All this has been so confusing, as we were bombarded with dozens of payment apps such as Google Wallet app, Android Pay, Samsung Pay and more. Now Google has thought of sorting this out. It is uniting Google – Android Pay into one named as Google Pay. This means, soon Android Pay on your phone is going to get replaced with Google Pay. Well, this might confuse people more. Google says Google Pay is now available “on Airbnb, Dice, Fandango, HungryHouse, Instacart, and other apps and websites you love.” What does all this mean? Nothing is clear so far. Do the companies need to do something to support the services? None of these questions are answered so far. All we know is Google Wallet app and Google Pay is getting redesigned. Everything saved in the wallet like your credit card and banking accounts details will be available on the new interface. You will be able to pay for things like before, the only difference would be the service used will be called Google Pay. “With Google Pay, it’ll be easier for you to use the payment information saved to your Google Account, so you can speed through checkout with peace of mind. Over the coming weeks, you’ll see Google Pay online, in-store, and across Google products, as well as when you’re paying friends,” he added. Well, this seems to be the first step of making payments on your Android seamless than ever, let’s see what’s more to come.